File contains a complaint and report of investigation regarding the complaint in Hasting County School Tyendinaga #18 in South Hastings. The file contains several newspaper clippings from the summer of 2004 about a reunion of classmates of the Carter School, SS#26, Tyendinaga. File contains original letter written from Vera Ryan to Carl Bateman (Clerk-Treasurer, County of Hastings). 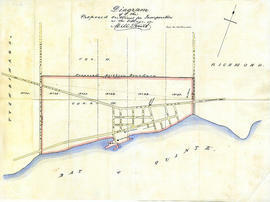 Attached is a history of the community of Deseronto in the Township of Tyendinaga. File contains a newspaper article from the Intelligencer, dated 13-June-1967, titled “Woman's Penchant for Stone Houses Led to Purchase of Lonsdale Mill”. File contains two copies taken from the Hastings County Directory, 1860-61 with a brief description of Milltown and listing the local business'. File contains an original letter dated 20-April-1836 from J. Givins, Chief Superintendent Indian Department requesting a list of "squatters" on the land. File contains several newspaper articles from the Ontario Intelligencer about the Shannonville Fair and the closing of the Old Shannonville Store. File contains original copy of the Certificate of Deputy Reeve Affirmation dated 16-January-1871 certifying thatWilliam McLaren was duly elected Deputy Reeve of the Township of Tyendinaga. File contains original copy of the affidavit, dated 17-January-1859 certifying that Nathaniel S. Appleby was duly elected Reeve of the Township of Tyendinaga. File contains a copy of a publication written by Clara McFerran, printed in the 1940's, titled Catholic Pioneers of Tyendinaga and Neighbouring Townships. Files contains copies of newspaper notices from the 1800's regarding auction of property, notice to debtors, tender and sale of farm. Files contains an original bill of sale from the J. & J. McCullough Merchants, dated 26th-November-1875 to Mr. John Frances. Files contains a newspaper article dated 27-January-1966 titled "Tyendinaga Is at School Crossroads, Suggest That Deseronto and Reserve Share in Central School's Services".